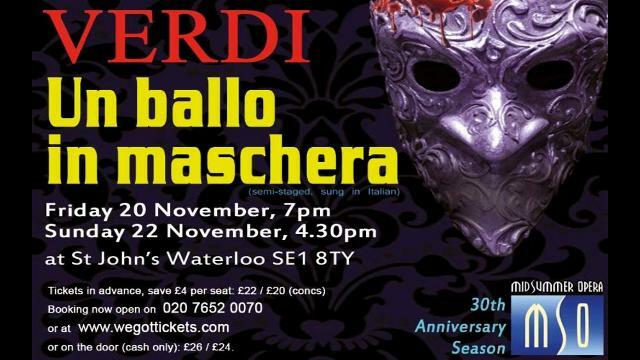 Midsummer Opera presents Verdi's Un ballo in maschera this weekend in semi-staged concert performances at St John's Church, Waterloo on Friday 20 November 2015 and Sunday 22 November. The cast includes John Upperton as Riccardo, Jane Streeton as Amelia, Andrew Mayor as Renato, and Joanna Gamble as Ulrica, with David Roblou conducting the Midsummer Opera Orchestra and Chorus. Based on the assassination of King Gustav III of Sweden, Verdi's opera suffered from problems with the censors and Verdi's original intention to have the piece set in Sweden with the title character being Gustavo was prevented and the work was premiered with the title role now Riccardo, Governor of Boston. Ultimately though, the work's location matters a lot less than Verdi's brilliant handling of the conflicts between love and duty. And of course, the opera is in fact entirely a-historical, as King Gustav III was in fact assassinated by a group of aristocrats opposed to his increasingly autocratic rule. And the real Gustav would have been unlikely to have had an affair with his best friends wife as he was thought to have been predominantly homosexual.